Sep. 4, 2014 7:00 a.m.
Reynolds Alberta Museum was prepared for a large crowd for the annual Harvest Festival August 30th and 31st, 2014. In addition to the 600 vehicle paved parking lot, an extension was added in the grassy area leading up to the highway. On both days, both parking lots were filled with vehicles and the grounds were swarming with people trying to re-live their early farm experiences and share them with their children, grandchildren and in some cases great grandchildren. Harvest Festival is the perfect opportunity for old-timers to reminisce about the nostalgic sights, sounds and the smells of bringing in the harvest amidst all the displays and demonstrations of old equipment bordering a field of golden wheat. As Cynthia Blackmore, explained, “The Festival attracts more people each year possibly because there is so much machine power, not only on display, but operating.” Activities included stationary engine displays, tractor starting and driving demonstrations, field work, and threshing. The Harvest Festival is all about agriculture and equipment that were used in years-gone-by leading to modern day agriculture practices. In the past, most people knew how their food arrived at their table by direct experience with farming. Urban families would visit the grandparent’s or uncle and aunt’s farm and see first-hand how their food was grown and where it came from. Today, fewer than three out of every 100 Albertans are involved in farming. As a result, a large percentage of our population is a few generations removed from agriculture and the agri-food industry. The ‘industrial’ type of farm operations we see today are so much bigger, it limits the opportunity for youth of today to experience first-hand how food is produced. The Reynolds Alberta Museum is helping address that gap by hosting the Annual Harvest Festival. Martin Equipment’s display of a massive modern combine, baler and tractor was a major contrast to the old 428 Cockshutt combine that was working in the adjacent wheat field. Martin Equipment, Wetaskiwin, a sponsor of the Harvest Festival, illustrated how Alberta’s agriculture and food industry has been undergoing momentous growth and changes for more than 100 years. The ‘straw hat and bib overalls’ image that portrayed farmers for many years has been replaced by that of advanced business people operating precision computer operated equipment, using modern business practices and working in a global economy. As the crowd moved from demonstration to demonstration, it was the old fashioned threshing demonstration that was the main act. 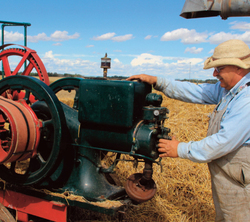 The huge vintage tractor chugs into position, is connected to a large belt, the gears are engaged and the threshing machine begins to rumble. As the volunteers pitched bundles of grain into the feeder of the threshing machine, it wasn’t long until straw and chaff spewed into a pile and grain flowed into a wagon parked next to the machine. The Harvest Festival allows people of all ages to reflect back. The smoking, chugging, and massive steam traction engines are the real crowd-pleasers of this show. The displays and demonstrations depict farming from the time of flailing grain to steam engines, to gas tractors, to diesel tractors to larger modern equipment. Attractions and demonstrations kept guests busy for the entire day. Grain grinding, flailing of grain to separate the kernels and straw and touring through the impressive display of vintage vehicles and agricultural equipment in the museum are all part of Harvest Festival.